Whether it’s virgin sealed cylinders, or used refrigerant evacuated from your chiller system, Refrigerant Supply Inc. will purchase your refrigerants. Whether your gas is located in California, or Maine, our network of common carriers will pick-up your gas at no charge to you. Refrigerant Supply Inc. provides a turnkey service from preparing your bill of lading, to scheduling your pickup. If you need cylinders for your gas, Refrigerant Supply will send out 125, 240, or 1000-pound cylinders at no charge. These clean empty cylinders are shipped under a vacuum to help speed along your evacuation. 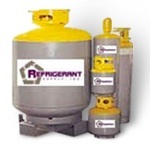 If you prefer to use your cylinders, Refrigerant Supply Inc. will evacuate, clean and return them at no charge to you. If your gas is used, Refrigerant Supply will pay you for 100% of the refrigerant sent to our facilities. We will not charge you for the waste oil or water contained in your refrigerant. To qualify as virgin refrigerant, the material must be packaged in its original containers and still have its original factory seals. While not required, it is desirable that 30 and 50 pound cylinders be packaged in their original boxes. To qualify as reclaimed, the refrigerant must meet ARI reclamation standards. To view ARI standards, go to our Reclaiming & Reclamation page. Most refrigerant reclaiming facilities will provide a certificate and put a reclaim seals on the containers to verify their purity. If you possess refrigerant that has been removed from a chiller system, it is highly unlikely that your refrigerant will meet these analytical parameters. Should you still feel your material may pass this criteria, you can have your refrigerant tested by ISI (Integral Sciences Inc.). You will find contact information for ISI on our Refrigerant Links Page. This is the category you should count on when refrigerants are removed from service. In this scenario, the material contains contamination of air, water, oil and particulates. This refrigerant is still a marketable commodity, yet will require shipment to a reclamation facility for processing. Refrigeration Supply can coordinate this processing activity for you, or we can simply purchase your refrigerant as is. This category indicates that your refrigerant is not just contaminated with air, oil, water, and particulates, but rather also contains contamination from other refrigerants or solvents. This material will require extensive processing to make your refrigerant a marketable commodity. In this circumstance, your product may, or may not, be economically feasible to be reclaimed.